We are living in the world of the cool factor. It is reflected in the markets – Tesla is the ultimate example with bystanders hanging on to Musk’s every word and a market capitalization that recently surpassed that of Ford and GM. It is reflected in the massive consumption and use of technology from companies of the likes of Google and Apple. And it is reflected in the companies we deem exemplary. The cool factor is ubiquitous and has tremendous implications for influencing behavior. Why else would one stand in line (or sit in a tent) overnight, waiting to purchase their seventh version of an Apple iPhone with roots over a century ago by Alexander Graham Bell? Because the emotional response of owning the coolest new gadget overwhelms the rational thought of staying in bed. Apple is often just one step ahead of everyone else, in terms of innovation, sexiness of products, and commitment to doing good by doing well. The company was founded upon the premise of telling consumers what they wanted, rather than asking for consumer insights – a phenomena that can truly only work for companies dripping in cool. And just in time for Earth Day, Apple recently stated its intent to make all of its products entirely from recycled materials and to “end our reliance on mining altogether.” The company has admitted this is no easy task and that it is taking a rare approach in stating a goal before fully knowing how exactly said goal will be achieved. But if anyone can do it, Apple can. The world’s second largest smartphone maker is continuously trying to better its production process, using 27% less Aluminum and emitting 60% less carbon to make the Apple iPhone 7, as compared to the previous iteration of the Apple iPhone 6. In 2016, the company reported the use of 100% renewable energy use in powering its global facilities – the first major technology company to declare and fulfill such a commitment. The tech titan has also committed to helping its suppliers generate four gigawatts of renewable energy by 2020. The force of positive externalities is strong. Corporations with vast influence and complex supply chains have the incredible power to influence the behavior of others. Apple’s seven largest suppliers have pledged to power their Apple production with 100% renewable energy by the end of 2018. We wanted to demonstrate how business can lead in driving the reduction of global emissions. Apple won the 2016 Environmental Finance corporate bond of the year (yes, this accolade actually exists), with a $1.5 billion green bond – the largest ever US corporate green bond – issued in February, 2016, with lead underwriters Goldman Sachs, JP Morgan, and Bank of America Merrill Lynch. Green bonds are a fixed-income financial instrument increasingly growing in popularity, as the capital raised from green bond issuance is dedicated to environmental programs. The bond was the first green issuance from a U.S. technology company, eventually pricing at 135 basis points over U.S. Treasuries. The bond was 2.2x over-subscribed, reaching an order book of $3.335 million, and is expected to be fully allocated over two years. By September of 2016, $441.6 million had already been distributed to 16 projects, most dedicated towards green buildings and renewable energy. These projects are anticipated to generate over 20 MWh of renewable energy each year and save 237 MWh of energy. Moreover, these projects have been calculated to save 20.2 million gallons of water, divert 6,670 tonnes of waste from landfill, and lead to a reduction of 191,500 tonnes of carbon emissions. 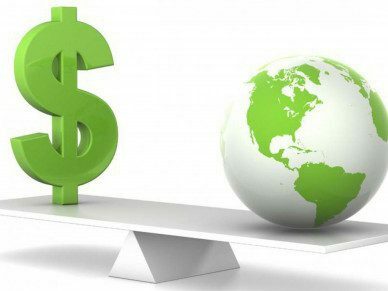 The financial markets and the role of big corporations are two of the most important levers for sustainable change. Ever the innovator, Apple is sure to develop some unique programs in the near future in order to fulfill its recycling mission. Stay tuned and Happy Earth Day! Featured below: Earth day, 1970. This picture lends to the question: have we as a global society progressed or digressed in terms of environmental sustainability? On one hand, consumption has increased at a rapid rate, and the physical state of our Earth is in worse shape than ever before, as greenhouse gas emissions have increasingly destroyed our planet. On the other hand, sustainability has become a real focal point of conversation (for some), and advances in technology have enabled alternative energy uses never before deemed possible. Companies like Apple and Anheuser-Busch are committing to 100% renewable energy. Tesla’s market capitalization surpassed Ford and GM. Green buildings are cool and in fact, buildings like the Edge in Amsterdam generates more electricity than it uses. Paris recently made all public transportation free. So, are we progressing or digressing? Food for thought. I think we are progressing. Posts such as this increase awareness which is the first step to change.